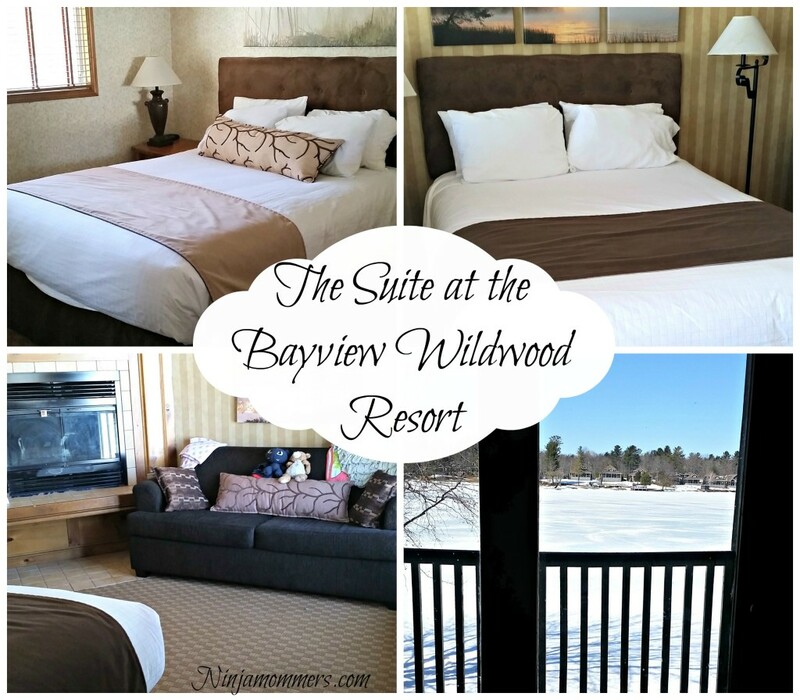 We had the chance to Tap into Maple with a Maple Infused Stay at the Bayview Wildwood Resort with our family and let me tell you… FUN! 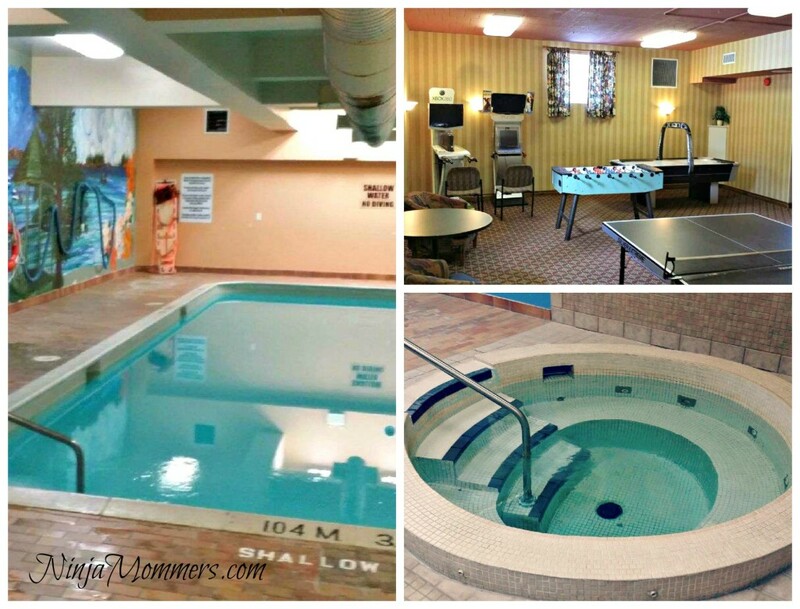 The Bayview Wildwood Resort is a great place to visit with your family in all seasons. Located in the lakeside village of Port Stanton, The Bayview Wildwood Resort welcomes families and has for over 110 years! Let me just start by saying that my family was super excited to start our weekend Tap into Maple adventure at the Bayview Wildwood Resort. We were all ready for a full weekend of amazing Maple Goodness filled with visits to the Springwater Harvest Festival and Shaw’s Pancake House and Maple Syrup Bush! 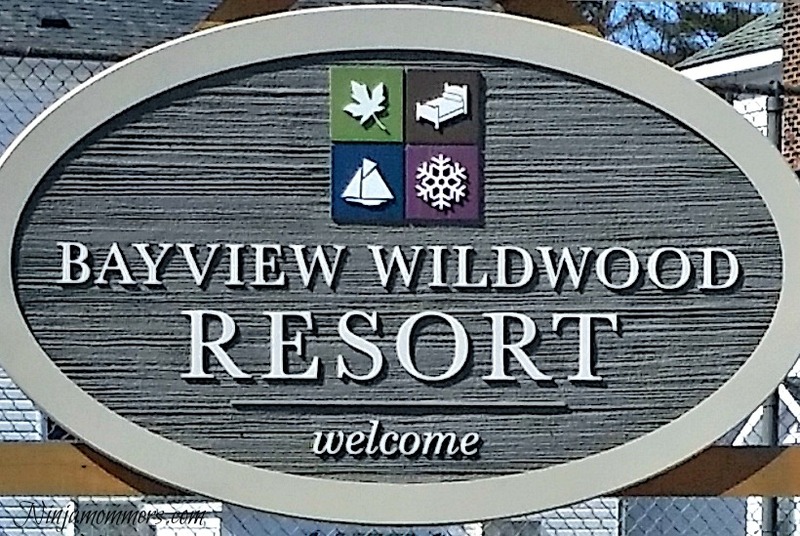 Checking in to the Bayview Wildwood Resort was a breeze and the young lady at the front desk was super knowledgeable and helpful. So polite and friendly. The kids waited in the car with Daddy though, as they were so excited they may have scared the lady at the front desk. They were literally vibrating. Once we checked in, we headed to our room to get the kids settled. Like I said, they were vibrating with excitement so it was time for them to take a deep breath and CALM DOWN. We stayed at the Walton House Suites, and were so happy with the room. The suite we stayed in had two bedrooms, a large Jacuzzi tub, a fireplace, a seating area and a large comfy couch. Did I mention the view from the large windows and door that lead out the large balcony overlooking Sparrow Lake? It was beautiful! It was love at first sight. The fact that there was a separate bedroom for the kids, was fantastic. It makes family travel much easier when the kids have their own space to sleep and relax in. The kids were so excited that they got their own room, that they started setting up their stuff immediately. Let’s be honest, hubby and I were happy they had their own room too. I love my children, but bedtime is my quiet time and sleeping with my 6 and 3 year old…. not ideal. So the fact that the Bayview Wildwood Resort provides these kinds of suites, makes travel with your family easier. The suites are cozy and have an amazing “home like” feel with the sitting area and the inviting fireplace. They were also quite well kept, and the staff was excellent and diligent about ensuring they stayed that way. 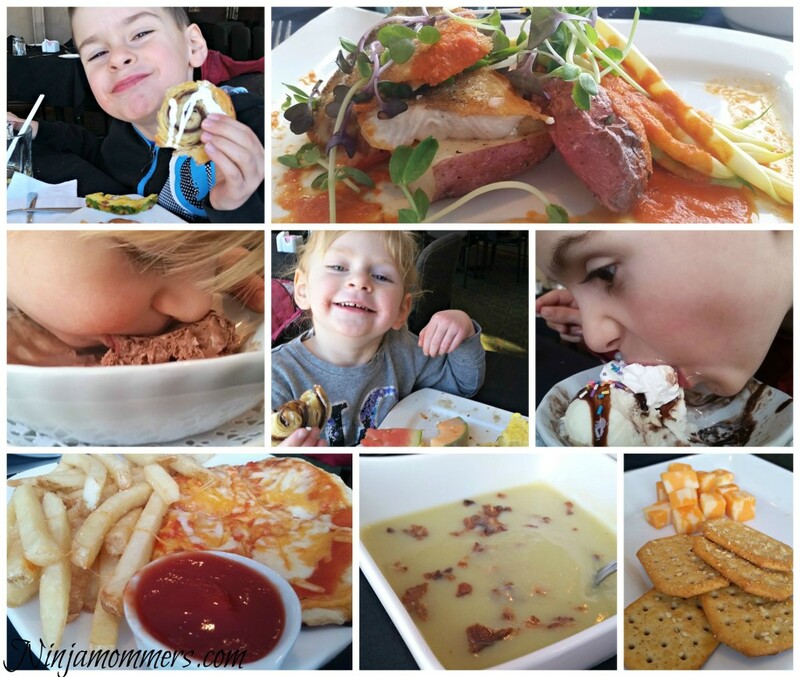 We enjoyed 2 breakfasts and 2 dinners at Echo’s Lounge and we couldn’t have been more pleased. The experience was phenomenal and the kids were incredibly happy! When we went for dinner the first night, the kids were excited to get all dressed up in their finest. They even took a cute selfie. Echo’s Dining Lounge offers a beautiful panoramic view of Sparrow lake and we were taken aback with just how beautiful the lounge was! It would be a beautiful venue for a wedding. The staff was excellent as well and fantastic with the kids. The kids had a great time talking to them and even got to help them do some small tasks around the dining room. They were super patient with my kids when they were incredibly excited, but also on Saturday night when they were grumpy and tired. The food was beyond amazing! Breakfast, for both the days we were there, was offered buffet style. The spread was amazing. Both days, breakfast offered different items to choose from too! There were hot items like pancakes, french toast and bacon just to name a few. Cold items like yogurt, cereal and fruit were also offered. The kids had a blast getting to pick what they wanted, and they loaded their plates and tried a little bit of everything. I enjoyed everything I tried, which was pretty much everything offered, and we headed back to our suite after breakfast feeling beyond satisfied. Dinners at Echo’s Dining Lounge are full service and provide up to four beautiful entrees to choose from. There are always a choice of two to three different appetizers and an amazing offering of mouth watering desserts all made ON-SITE! You heard me, the Bayview Wildwood Resort has an on-site bakery. I think I could live there. We loved our meals and again, headed back to our suite full and happy. There is lots offered for entertainment at the Bayview Wildwood Resort! 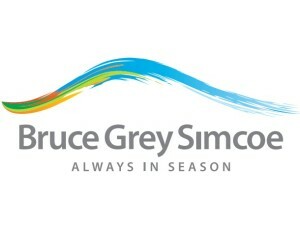 Even in the awkward “spring/winter” mash up weather we have been having. This “Sprinter” didn’t get in the way of some awesome fun at the Resort and we took advantage of many of the different on-site amenities. After our dinner the first night, we headed to the front desk to borrow some board games. The selection of board games they have is extensive and includes many recent and older games as well as games for many different age ranges. Little man and I actually played one of them for a few minutes at the front desk with the lady to test it out to make sure that it was the right one for us before bringing it back to our room to play in front of the fireplace with Daddy and Baby Girl. On Saturday morning, the kids woke up early so before going down to breakfast, we were able to watch one of the free movies offered in our room. The Bayview Wildwood offers are selection of family friendly movies during the day, that can be enjoyed in your room! The schedule can be picked up at the front desk. In the evening, they also offer a few great movies for the older kids. The indoor pool and hot tub were fantastic. The kids had a great time swimming with us before dinner Saturday night and what better way to tire them out than to take them swimming! The pool was large and clean. There were pool noodles and tons of clean towels. I also quite enjoyed the fact that there were change rooms so I didn’t have to come and go in my wet clothes. We all swam until our hearts were content. May I also mention the kids slept like angels that night? We didn’t have a lot of time to go and try these out, as we were super busy doing other great stuff too, but I did go scope them out and they looked like a whole lot of fun. The games room would be great for a rainy day and of course the fitness room is great to be able to workout! Not only did we have a great time at the Bayview Wildwood Resort, on our wonderful Tap into Maple weekend, but we also got to visit the 24th Annual Sweetwater Harvest Festival at Wye Marsh and Shaw’s Pancake House and Maple Syrup Bush for some amazing pancakes made by Teri Lynn Shaw, herself! This is how we Tap into Maple! All in all we had a wonderful weekend full of amazing food, delicious maple treats, great service and so many memories for my family! The Bayview Wildwood Resort comes highly Ninjamommers recommended! 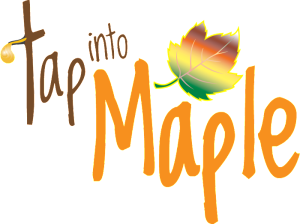 For more information on how you can Tap Into Maple Check out the Websites below or Follow on Social Media and Tap into Maple this Spring with your family. Follow the Hashtag #TapIntoMaple to stay in the know about upcoming events! 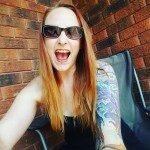 Disclosure: Ninjamommers and her family recieved perks in order to faciliate this post. All opinions are of her own and not influenced in any way. That sounds like the most amazing experience. I would love to visit there with my family! This hotel looks fantastic! So often families are an afterthought to hotels but this one really caters to families. Two room suites are ideal for larger families where one room just won’t cut it. It sounds like you had an amazing getaway. Wow sounds like a lovely place! I love the suite and that pool looks pretty awesome! I love a good getaway especially one that has good food! Looks like this was fun. I’m in Ontario too and never knew such a piece of heaven existed! Excellent review-I’d love to visit with my family. I need to take a mini vacay with my little one. What a great place. Lovely review! Wow, that looks like an amazing resort to visit. So serene! This place look so amazing! I could use a really good vacation! I’d love to stay in a place like that some time. The pool and game room areas sound really nice! This looks like an amazing place to take a vacation! What a gorgeous resort. We need to consider this place for a summer family vacation. This looks like such an amazing place to take the family. I love that they have in room board games. Sounds like a wonderful stay! I love the kids’ selfie too haha so cute! Looks like a great place to stay. Super family friendly too! Nice! Looks great! Gorgeous views AND separate rooms for the kids? Can I move in, now? Such a nice room, and you had a pretty view, too. Looks like the perfect family-friendly place to stay. Now that is a lovely resort. I love the little details, like free movies and board games. Really makes one feel feel like they are home away from home. This looks like a beautiful resort to stay at. I love the decor of the rooms. The food looks delicious. wow, that suite sounds amazing and the view? WOW… I totally want to go stay there now. Thanks for sharing. This looks like an amazing place! I’d love to visit – and would love all that delicious food! I was born and raised in Toronto Ontario this is super close to where I used to live before I moved here to Michigan. I am loving everything about this resort I really would love a vacation right about now. Someday I keep telling myself, someday. It just looks so stunning I guess I can dream about a mini vacation for now until I can afford one. I am glad you got to experience such an exciting resort and looks like it is very well kept up. This resort looks beautiful! I love the amazing view! I love the pillows that look like they have branches on them. Also, the food looks super tasty! Oh man, looks dreamy! That food has my tummy rumbling! Sounds like your family really enjoyed themselves! Everything about the trip looks amazing! This looks like an amazing resort. I love hotels that allow family separation in the room makes it a more relaxing trip. What a gorgeous place for the whole family! I love that the kids have a separate room. I love to find property that offers so much for the entire family to enjoy. The food looks just divine. This place looks awesome. I would love to visit one day. Looks like a great place to stay. We are hoping to get things stable to a point where we can take advantage of having jobs that can be mobile and do a lot of travelling over the next few years. This is a fantastic hotel. I love that it allots for extra space.